I’ve already written two books this year – Elvis and the Blue Suede Bones, a Southern Cousins Mystery (April) and all the lies (coming October), the third novel in a 4-book suspense mini-series I’m writing with three of my BFF’s, who are all wonderful writers. I’m now in the process of creating a new novel. It’s impossible to tell you exactly how I do this, for each writer has a different creative process. Even mine differs from book to book. This time I started thinking about an ordinary event (a wedding) that happens to almost every family. Then I imagined what could go so horribly awry that an event meant to be one of their happiest would rip the family apart. This time around, the plot was easy for me. All the elements I need to make the story a page-turner fell rapidly into place. It’s the characters who are giving me a hard time. There can be no great books without great characters – those who are so believable, so relatable the reader feels as if she has known them for years. Several of the characters for my next novel sprang to life quickly and revealed their secrets and their dreams to me. Others are staying stubbornly silent. This probably means I’ve taken a wrong turn in my thinking. There’s a hole in the plot or I’m consciously trying to put the wrong type of character into the novel. That’s where a writer’s instincts come into play. There’s no science to creating a novel, no rules. I’ll know when I get it right. Period. What’s the title? I don’t know yet. That, too, will be revealed to me at the right moment. 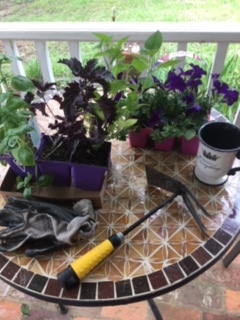 While I wait for my characters I will garden (I planted basil in my culinary herb garden this morning) and play the piano (I have a wonderful new book of cocktail jazz arrangements I dearly love). Meantime, send chocolate!